You can kick the worry habit! You are here: Home / Grace on Parade / Are You a Worry Wart? Do you ever worry? Every one of us worries at some point! Some of us are more prone to worry than others. You may not realize you are worrying – but any time you spend extra energy and time figuring out solutions to tsomething that may not even happen, you may be worrying. I like what my husband says. He admits he is a “reforming” worry wart. Getting better, but still not there yet. Because of that struggle, he was able to share some awesome thoughts in a recent sermon. With his permission, I’d like to share some of his one-liners with you. How do you know if you are worrying? Worry plays the “what if” game. What is the difference between worry and concern? Concern takes action – even if it is the active decision to let the problem go. Ask, what is the worst thing that can happen? Calmly proceed to take action on the worst. Remember this: “God is big enough.” He loves you. He delights in you and He really does want to take care of you. So, what are you worried about? What are you failing to trust God about? What are you going to do about it? What's So Wrong With Worry? This is powerful. I should read this at least every other day as a reminder. 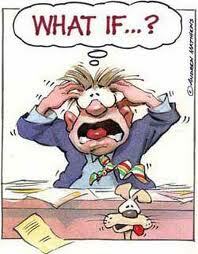 Janice D. Green recently posted..Blogging Blues – Slump or just needing time to re-group? Thanks, Janice. We all need to grow in this area. I would say I’m not a worrier either – not like some people! Then I catch myself trying to think through something when the truth is I need to let God take care of matters. I once heard a sermon on worry and he ticked off the actual amount of things we worry about coming true. I think it was in the 10% range. Sometimes I get confused between worry and problem solving. It’s a fine line. It is a fine line! I’ve heard it expressed as the difference between worry and concern, that concern is when we do something about the problem. But it is more complext than that. Sometimes worry leads us to try to “fix” the problem ourselves when we should be letting it alone and allow God and others to solve it. Karen, you asked me to share the quote from one of our former trustees for the Deaf Institute, Howard Wakefield: “If you are going to pray, there’s no need to worry; if you are going to worry, there’s no need to pray!” nuf said! Anyone else have some good quotes about worry? What is accomplished by worrying? Nothing! 🙂 I love this blog. It’s so cheerful.